Make your own custom phone case for the Sony Xperia X. Create a unique transparent phone case with your own picture or design. Keep your phone stylish. Keep your phone protected. Protect the back and sides of your smartphone with a custom phone case! Are you afraid of damaging your precious smartphone? Custom phone cases can help prevent any unwanted and unexpected cracks and scratches on your device! A custom Sony Xperia X hard case primarily protects the back and sides of the phone, meaning you will have full unimpeded access to your screen at all times. The hard case is also made of polished plastic and can absorb impact damage like no other model! Sony Xperia X custom phone cases fit well in your hand and have openings where all the buttons, ports and speakers are, so you can easily listen to music, charge your phone and take pictures whenever you’d like, without any problems! 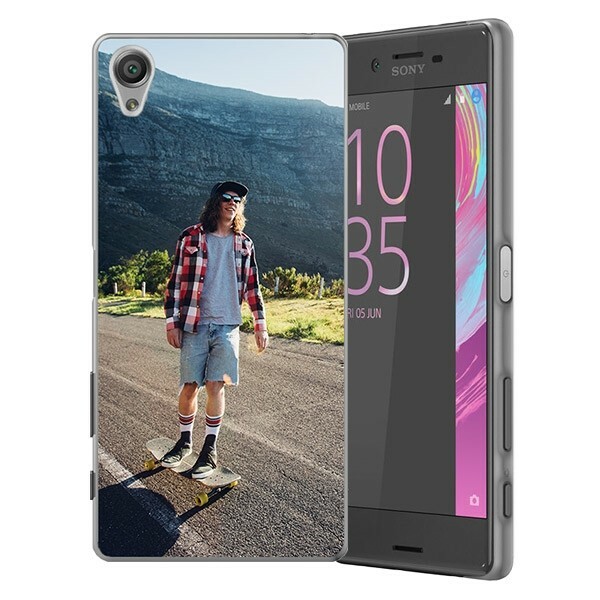 A custom Sony Xperia X phone case not only protects your device, but makes it look great! When printing your design, we use UV printing, which will result in a sharp and clear product. Additionally, the high quality ink we use is scratch resistant, so you don’t have to worry about your picture fading quickly. Personalized phone cases are the perfect combination of style and protection and make for the perfect accessory! Our editor allows you to quickly and easily make your own custom phone case. Our built in editor helps you make your own a unique and custom phone case with ease! The designing process is not only simple, but fun! Within the editor, you have the option to upload any picture or logo you’d like directly from Instagram, Facebook or your PC! In addition, you’ll have access to our editor from almost any device, so you can design your own custom phone case from your PC, tablet and even your smartphone! There’s always the chance that you don’t have any ideas of what picture you can place on your phone case, so feel free to choose from one of our popular and trendy designs! So what are you waiting for? Design your own phone case today! It's completely up to you how you want to make your own custom phone case. With high quality ink and advanced printing techniques, we’re able to produce your order quickly and sharply! Therefore, you can expect your custom phone case to arrive within no time. Did we mention that we offer quick and easy shipping? If you can’t wait for your order to arrive, feel free to share your design with your Facebook friends right after checkout. Simply click the “Share” button under your preview and you’re good to go! Have more questions about your order? Contact our support team at support@gocustomized.com and they’ll inform you suitably.